Ludwig has been my violin since I was in junior high, and although I haven’t played him in years, he’s been giving me some big trouble lately. Ludwig, named after Beethoven (my obsession emulated Schroeder’s), served under my chin on three continents, in a total of eight countries. 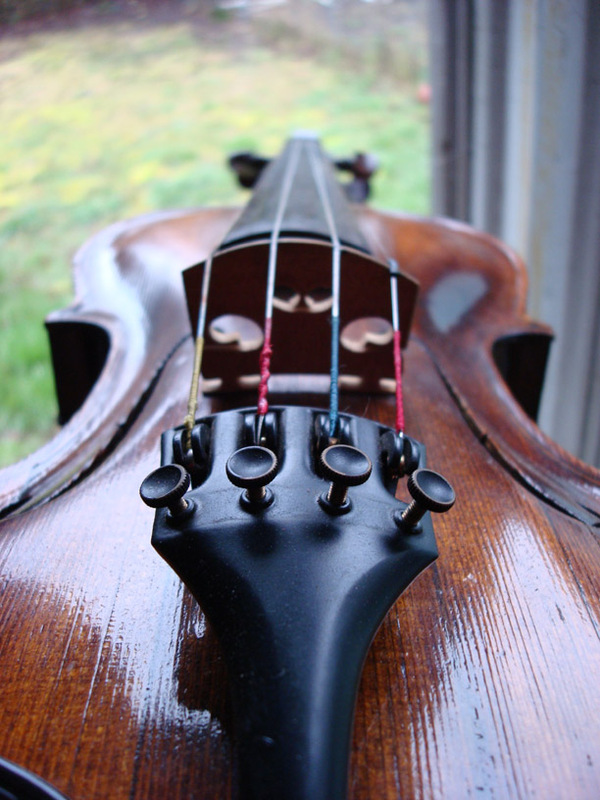 He has always been referred to as “my good violin.” Once we were together, I was beside myself whenever I needed to use the other one, which looked, felt, and sounded much cheaper. The first thing that drew me to Ludwig was the dark, rich colors of his wood, and his unusual face shape. His back displayed dramatic brown flames, in colors I have yet to see again in a stringed instrument. Whereas most violins had a fairly flat face, Ludwig had more dimension–his best feature, and ultimately his undoing. When we were on the prowl for a better violin, my teacher suggested we attend an auction one summer day in rural Clackamas County. The former resident of the house, now deceased, had been a violin restorer and there would be opportunity to nab one inexpensively. Once I decided Ludwig was the only violin I had eyes for, my mom set a limit of a $300 bid–if anyone bid more than $300, the day would be a wash.
A few other interested parties bid on him. One by one they dropped out as the price rose, until we reached that magic $300 number. The other man who had still been bidding gave up, and Ludwig was all mine. Clearly, we were destined for each other. Soon, Ludwig and I traipsed across central Europe (Germany, Austria, Hungary, and what was until two weeks after our return, Czechoslovakia) with my orchestra. Two years later we went to Japan and played Beethoven’s 9th for the righteous citizens of Kurobe. We spent countless hours together, whether he was strapped to my back en route to a lesson, on my knee during an orchestra rehearsal, or just quietly lying next to my bed while I worked on an English paper. One bleak spring morning when I was a freshman in high school, I opened Ludwig’s beautiful brown case to show him off to a friend. Despite being peacefully cradled in cushy green velvet, he suddenly sported a large crack in his face. I was horrified, fearing that my beautiful violin was destroyed, and spent most of the day with my stomach in knots. Ludwig was soon repaired, and my mind was at ease again. A few years later though, another, smaller crack appeared. When he was repaired again, I started wondering whether I should always keep him a certain temperature, or store him in a humidity-controlled room. Given the poorly-insulated house I moved into my last year in college, then, it should have been no surprise that another crack appeared. At this point I wasn’t playing anymore, and didn’t get the crack fixed right away. At that point, I started trying to find a new home for Ludwig. Perhaps some underprivileged little child needed a violin that only I could provide? Might some artist be searching for a violin to incorporate into some piece of punk art? Did someone want a violin to give a rustic look to their cabin? No. Nobody wants a broken violin. And I can’t bear to part with him by sending him to a landfill or common thrift store, ignoring his brilliance. My years as a classical musician are still a large part of my identity, and coldly throwing Ludwig away would be a bit like cutting off my own broken arm. So Ludwig has been sitting in the back room of my house for the last six years, his chocolate-colored case collecting obscene amounts of dust, dirt, and dog hair. Much like the dust cloud that results when I move his now-faded case, the problem often gets stirred up when I’m clearing my house of clutter. What do you do with something that needs to go away, but on your terms, and that doesn’t seem possible? Last winter I envisioned a new idea: creating my own avant garde art piece, symbolically parting with my past self by burning and/or smashing Ludwig a la Jimi Hendrix, outside Jefferson High School’s auditorium, where my orchestra rehearsed every Saturday and had some concerts. When pitched to a test audience, the reviews were mixed. Some people loved the idea, but some were offended at the idea of destroying a beautiful instrument. Great art is always surrounded by divided emotional responses and controversy, though. Wouldn’t it be a fitting way to send Ludwig off? What do you think I should do with Ludwig, dear reader? Hang him on the wall as art? Carefully take him apart and make an art project of some kind out of his pieces? I have an acquaintance who repairs folk harps. Harps are under tremendous amounts of strain–there is pretty much no such thing as an antique harp, unless it was de-tuned for most of its life. They all eventually get ginormous cracks in them as they begin the process of collapsing in on themselves. But according to my friend who does repair, he says that harps almost always sound the best once they’re cracked, so it’s almost sad to fix them. “They sound their most beautiful just before they completely break,” he told me once. That just seems so beautifully tragic to me for some reason. Maybe because I just woke up. April, a crack in a violin makes it extremely difficult, if not impossible, to keep in tune; messes with the resonance; and it probably does accelerate the total self-destruction process. 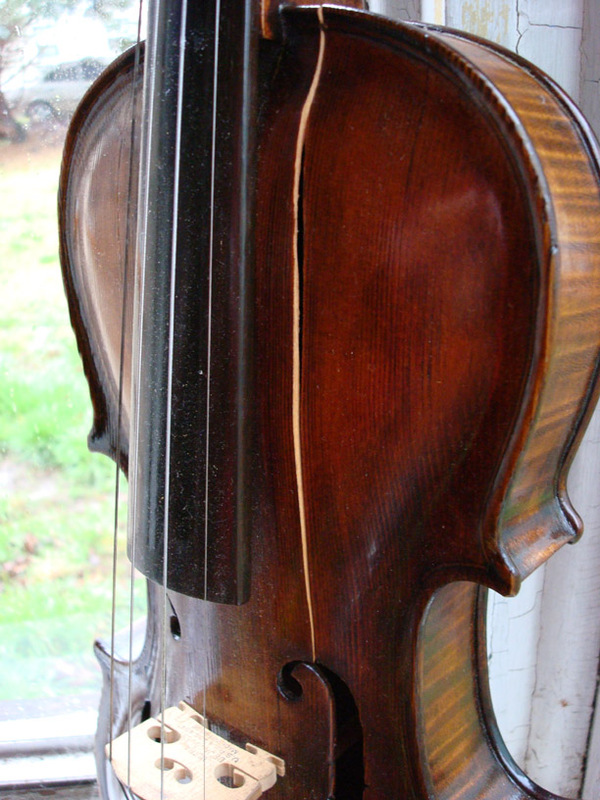 The crack used to be just a few inches long, and as you can see above in the photo, it has now taken over an entire quadrant of the face of the violin. It needs to be repaired to be played, and if it’s repaired, it’s only a matter of time before another crack appears. I like the smashing and burning idea. I’m a fan of repairing things. If it’ll hold for a couple of years, maybe repair (even re-repair!) is easier than the work that goes into building a replacement violin. Maybe (okay, almost definitely…) the tension built into the structure is a part of the sound and feel. Maybe that’s the price one pays for this instrument; maybe it’s high-maintenance in return for what it gives back to the user. But it’s tough to justify, on a personal level, investing in a repair like that if you’re passing it on. Unless you have someone available who’s worth the investment, who’ll understand and accept the fickle temperament of the instrument you’re giving. Sounds like that isn’t feasible… In which case, I vote for art. Storing a broken part of your past usually isn’t a positive activity. I think it’s also good to acknowledge the significant past, which is why I think art > dumpster! Update! Ludwig has found a new home through Freecycle. After receiving about 12 responses to my post and reading each person’s proposed use, I rehomed Ludwig (plus his bows and case) with a group of CSA farmers. They intend to use Ludwig to play at their weekly dances, once the former luthier in the community repairs him. The farmers are so rural that they can’t even get radio, so Ludwig will be a prime source of art and entertainment. What’s really funny is that once I chose where he was to go, getting rid of him was surprisingly easy. And now, one less thing to collect dust and hair and clutter up my back room!